﻿Every year millions of people have medical conditions that lead to cardiac and respiratory failure. Extracorporeal membrane oxygenation (ECMO) is a temporary mechanical support system used to aid heart and lung function in patients with severe respiratory or cardiac failure. Although it will not heal the heart or the lungs, it allow time for them to rest and recover. Recent advancements in the application of ECMO have led to significant improvements in clinical outcomes, and clinicians urge for an even earlier application and broadening of indications. However, there is a big drawback to the standard ECMO; it is not sufficiently portable. ECMO patients needs to be transported under severely restricted space conditions either within the hospital, from a referring clinic or even from the field of an emergency incident. 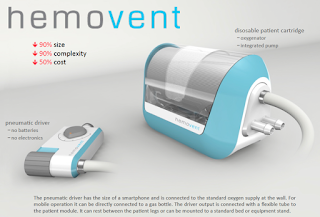 The Aachen, Germany-based startup Hemovent aim to develop innovative solutions that aid patients with lung and heart function while allowing them to be mobile. Founded by Christof Lenz and Dr. Oliver Marseille, they are developing the world’s smallest and first self-contained and fully portable ECMO system that supports and replaces heart and lung function in the event of cardiac and respiratory failure. Hemovent’s ECMO system is robust, operates like a natural heart, weighs only about 1 kg, and needs neither battery nor software. The system is designed to reduce complexity of operation by 90 percent, securing treatment safety, outcome, and reduce time and effort of training and education. And with the rising number of ECMO applications, cost-effectiveness plays an important role. The new system is specifically designed to reduce costs with up to 50 percent. Hemovent has a huge potential, and their portable technology could disrupt a market worth over $5 billion and growing rapidly by 25-30 percent annually. Since recent advances in the application of ECMO has led to improvements in clinical outcome, many strive for an even earlier use of the procedure. Hemovent is developing an innovative solution that make the procedure applicable in a variety of settings and indications. It can save millions of lives each year, require little training before use, as well as reduce costs compared to the current standard. The startup recently announced it had closed a $6 million Series A investment to obtain CE mark and achieve pilot sales. Led by MIG VerwaltungsAG, co-investors included WCTI Partners, Seed Fond Aachen, KfW Bank, NRW.BANK.Venture Fonds and PB Beteiligung- und Vermoegensverwaltung.